Hello there! 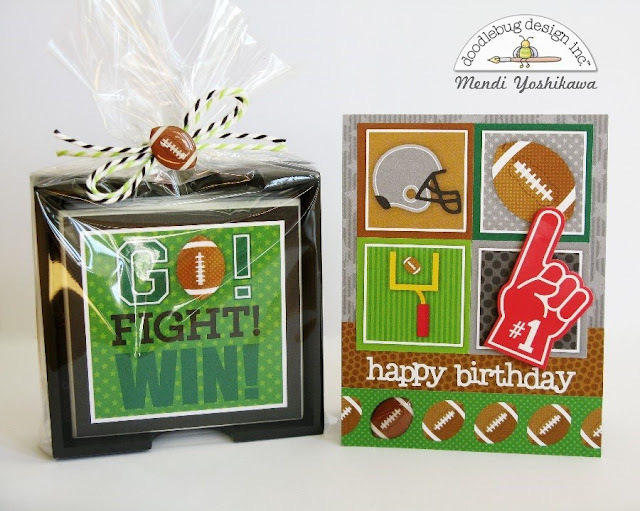 It's Mendi here today with a gift set using Doodlebug's new Touchdown collection and the new chunky twines. My Stepdad loves football so I thought it would be fun to create a special birthday card for him this year. I think the doodle pop foam finger is just about the cutest thing ever so I had to find a way to incorporate that. 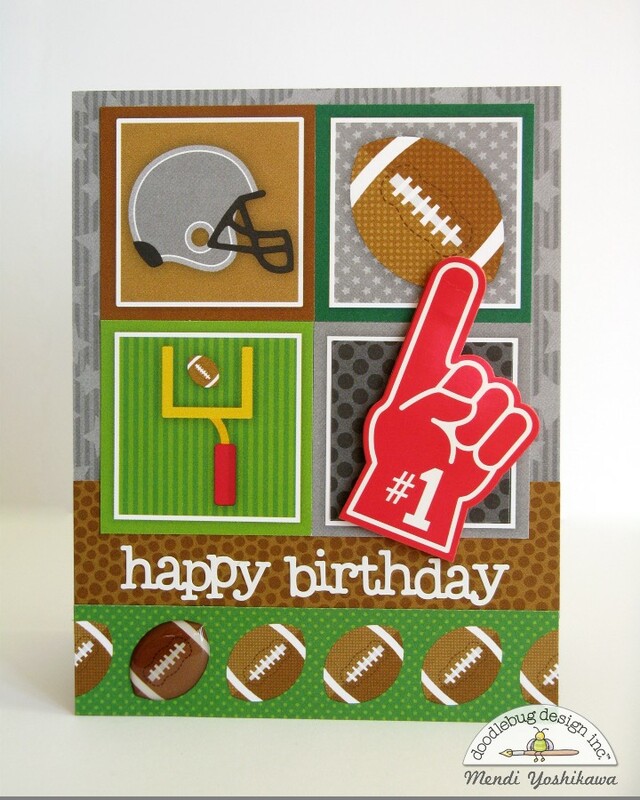 As you can see I tried to incorporate a little bit of everything on this card. 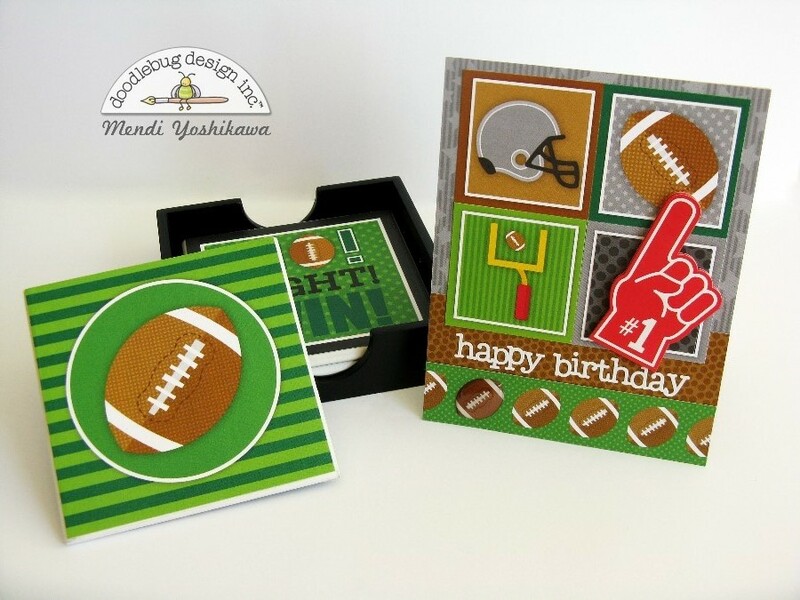 ;) I love how the football sprinkles are the perfect size to layer over the football border paper--I think it adds a little extra interest to what may otherwise be a pretty flat card. To go with my card I decided to also alter a coaster set by Sierra Pacific that I found at my local craft store. The coaster set was already painted black and white so I only needed to pick my favorite papers to decorate the two sides with and the lining of the box. The 4 x 4 squares on the "football field" paper were perfect for the job. The back of the coasters just happen to also be 4 x 4, but they are tapered on the front so I simply trimmed down my squares to be 3.75 x 3.75. I then used Ranger's Multi Medium Matte with an old paintbrush to adhere the paper to each side of the coaster, followed by two more coats to the exterior (waiting for them to dry between each coat). This product goes on extremely smooth and without the bubbling that I typically experience with other products. I love that it dries to a clear matte finish and now my coasters are ready to be spilled on without damaging the fun paper underneath. I must say I really had to fight the urge to add more cute details. I really wanted to go nuts, but in the end I decided my Stepdad would prefer them to be simple, functional and generally blend with their home decor so I kept the outside of the coaster box plain. I hope I've inspired you to take on this simple project for a sports lover in your life. I love that this idea would work well with any of Doodlebug's four new sports themed collections. This gift set is so awesome. I'm sure your step dad will love it!!! Can I just say total cuteness! Love this set and I know your step dad will too! Your card looks amazing as well! Love the coasters! Such a great idea! !